Reconnective Healing triggers significant changes in brain activity (via EEG scans) and heart activity (via ECG scans) of both practitioner and patient during healing sessions. In particular the practitioner's brain activity affects the patient's heart activity. The frequencies are strong and palpable and can normally be felt through physical sensation tests and have been proven to be real in double blind, randomized studies. (Refer to Dr. Gary Schwartz reference below). Unlike other forms of healing, including Reiki and Pranic healing, the level of healing received by the recipient with Reconnective Healing is not affected by the emotional state or stress levels of the practitioner. This has been shown in lab tests on heat stressed bacteria. There have been measured changes in levels of gamma radiation absorption during sessions. Normally the body emits a harmless low level of gamma radiation due to the presence of potassium in the soft tissues. In Reconnective Healing sessions, both the practitioner and the patient absorb it. Separate research into various systems of energy healing has shown a link between absorption of gamma radiation and healing. Other measurement studies confirm that Reconnective Healing practitioners emit and transmit an increased amount of light and other electromagnetic frequencies around their bodies. 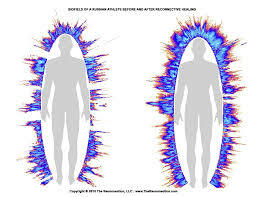 Reconnective Healing practitioners can turn the frequencies on, increasing the amplitude and oscillation of magnetic frequencies around their bodies. These changes have been measured in laboratory research. In laboratory studies, Reconnective Healing practitioners have been shown to affect changes in DNA, helping plants to heal after being "shocked" or damaged. Leaves that received four ten minute distance healings over a 60 day period remained intact, whereas 99% of the untreated leaves withered away within 34 days. Not only did the treated leaves fare significantly better, often surviving for more than 90 days, some also produced roots, indicating possible regeneration of an entire plant through the previously cut off leaf. A second plant leaf experiment was conducted, in which leaf biophoton emission was measured. As before, leaves were cut off from the original plant. Test leaves received a one-off 10 minute treatment and the other leaves were ignored. Treated leaves stayed alive for as long as 90 days, whereas control leaves died within 6-14 days. Energy healing directly influenced the longevity of the leaves, inferring a life sustaining impact on organisms, ie, human beings. Other tests have shown that the Reconnective frequencies bring harmony to chaos. Entropy is a measure of a system's disorder. It describes the natural tendency of systems to return to chaos in the absence of work to keep order. Your cluttered desk may be an example. In that sense, a healing session may help a person to "get back in order" energetically, that is, to decrease their body's entropy for regaining orderly bodily functions. Reconnective Healing has been shown to have a measurable, long-lasting positive effect on the health and well-being of recipients (See Dr. Konstantin Korotkov reference below). For over 35 years, Professor Tiller has been an advocate in pursuing serious experimental and theoretical study in the field of psycho-energetics which will most likely become an integral part of future physics. Professor Tiller conducted his experiment on the Reconnective healing frequencies for the first time at one of Eric Pearl's seminars held in Sedona, AZ in 2006, and found the results so extraordinary that he repeated his study into this phenomena three more times over the past couple of years, twice in Los Angeles and once in Tucson, just to be certain that his extraordinary data was accurate. What Dr. Tiller has now shown has the medical research community quite baffled. Dr. Tiller says: "In 1970, I was Department Chair at Stanford and I got myself seriously committed to being involved in psycho-energetic science in parallel with my conventional science. I've written four books in that area." "The issue is really one of information medicine, which is somewhat down the road from energy medicine, which is still down the road a little from chemical medicine. Chemical medicine is what we've had in the past, but we realised that - the simple metaphor is - if you put bacteria in a glass of water and throw some silver colloidal particles in there, it'll kill the bacteria. People thought that was due to the contact and that led to chemical medicine." "But, if you, in fact, have the same experimental setup, except you put the silver in as an electrode in a fluorescent tube and focus light on the jar, then you still kill the bacteria. That leads to energy medicine. Furthermore, we have found that, if in the same room you have the jar with the bacteria in the water and you plug in an intention-imprinted electrical device - then, in short order, you can kill the bacteria. That's really information that's been exchanged. And that leads to information medicine." "There are many energies involved in light. There is, of course, electromagnetic light, which everyone knows about. (The type of energy used in Reiki, Qi Gong & Pranic Healing). The coarsest level of the human body is all about electromagnetic energy. So you can use light in the way it's used in energy medicine, especially on acupuncture points, to systematically provide healing in the body." "Or you can go to a higher level.........magneto-electric energy. That has an aspect of light as well. And at all of these higher dimensional levels there is a light which is the communicator between the aspects of substance at that level of being. Many of these energies travel faster than the velocity of light." "We've developed an instrument now, which can access these higher dimensional levels of reality. It's just a beginning, but at least we can have a read-out. That's very important, so that we can begin to monitor the space in which Reconnective healers work and describe the level of effectiveness of what they're doing on a higher dimensional energy level, in terms of a quantitative measurement of that particular space." "So, when Eric Pearl talks about Reconnective Healing, then really what is happening is that many kinds of energy and light are flowing through the healer and into the healee. In other words, what we're talking about is bringing it beyond just what has been classically known as energy healing into a much broader spectrum of energy, light and information, as described above." Interestingly, we now know that the body heals through frequency, vibration and resonance and it's communicated through light. (The body takes a vibration and translates it into a healthy bio-chemistry and biology integration). Again, the fact that the Reconnective frequencies contain an element of light is very significant. In 1970, a German scientist, Fritz-Albert Popp made an interesting discovery while researching causes of cancer, that our DNA emits a certain level of light and that it uses frequencies of every variety as an information tool, which suggests that the body's physiological system depends on light waves. He found that the light was responsible for photo-repair of cells, and carcinogens causes cancer because they permanently block this light and scramble it so the photo-repair can no longer work. "As mentioned above, we did an experiment with one of Eric's healing workshops in Sedona last February and the data that we gathered was quite remarkable. First of all, we found that when we started monitoring the room (through measurement of air temperature, water temperature and water pH), which was about five hours before anyone – any of Eric's crew, or Eric himself, or the healees [sic] – ever came into the room, we measured a higher gauge symmetry state than in normal reality. It was already a conditioned space! So something had happened before people even gathered. That space was set up, and that made it easy then for healers to work." "As we continued to monitor that space, we found two days later the increase in this effective energy content was huge. Let me put it in terms that might be understandable. If we look at a normal reality and we say "What is the effective temperature increase for that normal space, how much must it go up to give the same excess energy content as was in Eric's workshop two days after he started? The effective temperature increase for a normal space would have been 300 degrees Centigrade! That is huge! (In particular if we consider that water boils at 100 degrees!)" When the teaching team during the seminar introduced a particular aspect of the work onstage, it was reflected in the measurements. Participants moving to the massage tables, learning how to work with the Reconnective Healing frequencies, further influenced the reading. A coherence effect between speaker and audience was also documented. These fascinating energy changes have now been scientifically validated at 5 different Reconnective Healing seminars. Dr Tiller's work with Reconnective Healing is also discussed in his latest book, Psychoenergetic Science: A Second Copernican-Scale Revolution. In September 2002 Professor Schwartz received a $1.8 million dollar grant from the National Center of Complementary & Alternative Medicine at the National Institute of Health to create a Center for Frontier Medicine in Bio-field Science at the University of Arizona, which he directed for four years. He is the author of The Energy Healing Experiments (2007), the G.O.D. Experiments (2006), The Truth about Medium (2005), Afterlife Experiments (2002) & The Living Universe (1999). Professor Schwartz is a Fellow of the American Psychological Association, the American Psychological Society, the Society for Behavioural Medicine and the Academy for Behavioural Medicine Research. He has served as President of the Bio-feedback Society of America and the Health Psychology Division of the American Psychological Association. In 2004 & 2006 he received a Distinguished Scientist Award for Energy Psychology from the Association for Comprehensive Energy Psychology and in 2006 a Distinguished Scientist Award from the United States Psychotronic Association. As the subject of highly specialised testing at The University of Arizona's Human Energy Systems Laboratory, the energy associated with Reconnective Healing has now been substantiated by controlled scientific experiments, according to Gary Schwartz and Linda G.S. Russek, Ph.D., the lab's former directors. The Human Energy Systems Laboratory used mainstream scientific methods to address questions in the areas of mind-body medicine, energy medicine and spiritual medicine. The focus of this laboratory was to reveal what is true and what is false. The Laboratory conducted four carefully designed experiments to prove how Reconnective Healing frequencies affect people by measuring the body's ability to emit, sense and feel vibrations. In the studies Eric Pearl and two of his students served as senders of frequencies while volunteers acted as receivers. The first test showed that blindfolded subjects could detect the energy up to 83 percent of the time. The second showed that the energy functions like an electromagnetic signal, Schwartz reported. The third showed that the sender's heart wave, measured by electrocardiogram (EKG) imprints itself on the receiver's brainwave, measured by electroencephalogram (EEG), particularly when the sender intends to send the energy. "Most significant in this third experiment," Schwartz says, "is that whether or not the receiver was consciously aware of the energy, the EKG imprinted just the same, so there is unconscious energy detection that can be recorded electromagnetically." The fourth experiment recorded the brainwaves and eye movements of 30 subjects under three different conditions. "Eric is genuinely just trying to understand it," says Dr. Schwartz. "I am very impressed with Dr. Pearl's credentials and his seriousness of purpose. Eric is very genuine. I'm impressed with his gifts and his interest in science. He really would like to understand what is going on. And although he has beliefs like we all do, he is willing to put those beliefs to experimental test. The fact that he would volunteer his time and perform experiments under controlled conditions in the laboratory and devote all his time shows his personal interest - nobody's making him do this." The conclusion of these experiments was that the energy was indeed real, detectable, measurable - and quite remarkable, Schwartz says. In another study, Dr. Schwartz focused his research on the people who attend Reconnective Healing seminars. He conducted baseline energy healing studies which measured people's abilities to work with, feel, transmit and receive light and other electromagnetic frequencies before and after they attended the seminar. What they found was dramatic. Of the more than 100 people who participated in the study, all walked out with permanently expanded and new electromagnetic abilities following the Reconnective Healing seminar, whether they had never studied healing before or if they were masters/teachers of the various energy healing techniques known today. Another experiment measured the impact of healing energy on isolated DNA molecules. The DNA was deliberately damaged by heat, before exposure to Reiki, Qigong and Reconnective Healing. Controls received no treatment. The progress of DNA self-repair was measured spectrophotometrically. Results were surprising: Whereas Qigong and Reiki significantly slowed down DNA self-repair, compared to the controls, Reconnective Healing significantly sped up the repair progress! Conclusion: Energy Healing directly affects DNA. Professor Korotkov has combined rigorous scientific method with an insatiable curiosity about the spirit and soul and has a deep respect for all life. He is also a scholar in philosophy and a serious mountaineer of 25 years' experience. He has given lectures, seminars and training sessions in 43 countries, presenting papers and workshops at more than 100 national and international conferences. He is author of Light after Life: Experiments and Ideas on After-Death Changes of Kirlian Pictures. Professor Korotkov is also associate editor of the journal "Consciousness and Physical Reality," which publishes articles in Russian and English. While Professor Tiller has been measuring the incredible field effects that occur at Reconnective Healing seminars and Professor Schwartz has been focusing his research on those who attend the seminars, Professor Korotkov has studied both. Professor Korotkov has developed a GDV (Gas Discharge Visualisation) device, which can capture the physical, emotional, mental and spiritual energies emanating from a human being (as well as animals, plants and inanimate objects). "It makes the old Kirlian cameras look like a bicycle compared to a Mercedes," Korotkov says. This imaging technology is used by more than 1,000 doctors, practitioners and researchers worldwide and is certified in Europe. (More than 150 papers published). It is used to diagnose underlying causes of any current imbalances by visualising the area of the body and the organ that needs to be addressed in order to restore health and balance. Korotkov said: "I was sceptical last year when The Reconnection approached me but after seeing the results of the testing we did at the 2008 conference I have no doubt that this is a new step in human development. Reconnective Healing is absolutely different than other healing modalities. From the experiments we have reached a very important conclusion: When we do Reconnective healing we tremendously change the environment. "Changes of participants' energy fields and chakras before and after the workshop demonstrate a strong positive effect of this process to the psycho-emotional state of people." He found that a person's energy field was more coherent after receiving Reconnective Healing than prior to exposure. Dr. Korotkov also carried out a double blind test of the influence of Reconnective Healing on the human immune system and psyche. Using a blood test and a standardized psychology assessment protocol (POMS test after McNair), he measured physiological and psychological states of people before and after a single session of Reconnective Healing. While the non-specific immune response was elevated (as demonstrated by blood counts), psychological parameters such as tension, depression, aggression, fatigue and confusion decreased significantly. Most notable part of this study is that the "after session" measurements were taken not immediately after the session, but 7-10 days later. Thus, results indicate a long term benefit of Reconnective Healing. Professor Korotkov also measured and documented a very large field effect at the Reconnective Healing seminars. These effects were most dramatic and powerful whenever a new concept or exercise was taught during the seminars and these teachings resulted in dramatic spikes in both the intensity and size of the field in the room. He theorized these "coherence effects" are what might be allowing normal people to gain these new abilities and become master healers in just a few days. Additionally, Korotkov's work demonstrates that most of those who are simply sitting in the seminar room itself receive positive health effects. In fact, it is not uncommon for people to have physical and other healings just from sitting in the seminar room during the class! In further studies completed in Russia Reconnective Healing was taught to a group of doctors, researchers, therapists and Olympic athletes. The results were astonishing. The design of the study was such that the test subjects were given approximately just five hours of teaching and interaction with the Reconnective Healing frequencies over the course of two days. Each of the seminar attendees was measured before, during and after the experiment, with various testing methodologies, including the use of Professor Korotkov's GDV device. When Professor Korotkov measured the attendees of the Olympian teams during the experiment, he reported that the results "were very, very strong and very, very different" than anything he had measured before in his work with the athletes. One of the significant changes observed was that it altered and positively changed the athletes' blood and DNA. It also showed a decrease in blood pressure, increase in metabolic, immune, anti-toxin and antioxidant activity in the body and improved cardiovascular function. Specifically, he reported that the effects of Reconnective Healing on the athletes and their energy levels were "hugely significant." On average, each of the athletes and test subjects experienced a significant increase in their energy levels. They were also able to enter into a "zone-like" state, where they were able to perform better on the field and off. These expanded energy and mental functions helped them to access and maximize their own physical abilities, which meant they were able to compete on higher levels. On average the energy filed increase for each person was 17% or more! Something extraordinary also occurred. One of the athletes arrived at the class with a broken leg and on crutches. He had broken his leg just four days before and was experiencing significant pain in it. Further, he was unable to bear any weight on that leg. During the course of two days, he spent some time on the massage table receiving treatments and after just these few interactions with the frequencies, he was able to put away the crutches and walk without them! He was able to do this without any pain and shared with us that he was very much looking forward to his doctor's appointment the next day. The doctor was amazed at the progress in the athlete and was stunned by the healing. Perhaps this is a new step in human evolution, where instantaneous healing and regeneration are simple, everyday facts of life. A study by the University of Arizona has shown that people who have a range of motion limitations in their arms and shoulders show a greater level of healing and pain reduction with a 10-minute session of Reconnective Healing than when treated with physical therapy. The study's findings were demonstrated in a TV segment on the Dr. Oz Show. Dr. Mehmet Oz said he was "flabbergasted" at what he saw. Dr. Mehmet Oz is vice-chair and professor of surgery at Columbia University. He directs the Cardiovascular Institute and Complementary Medicine program at New York Presbyterian Hospital. Host of the Dr. Oz Show. The reason I’m so excited and passionate about alternative medicine is because it is the globalization of medicine. Alternative medicines deal with the body’s energy — something that traditional Western medicine generally does not. We’re beginning now to understand things that we know in our hearts are true but we could never measure. As we get better at understanding how little we know about the body, we begin to realize that the next big frontier… in medicine is energy medicine. It’s not the mechanistic part of the joints moving. It’s not the chemistry of our body. It’s understanding for the first time how energy influences how we feel. According to Oz "energy medicine" is at the forefront of healing, but he acknowledges that he is sometimes a lone pioneer in this field. "I really think it would be cowardly to pull back and not challenge the status quo, when the status quo may not be the right way for the field to go," Dr. Oz said. Richard Gerber, MD is the author of the 1988 book, Vibrational Medicine: New Choices for Healing Ourselves, a publication that has been reviewed as a "landmark" and "encyclopedic" and in many ways bridges the gap between science and esoteric healing. Vibrational medicine is a diagnostic and healing approach to illness using energy in various forms and frequencies. It is the first scientific approach I've seen that is able to integrate science and spirituality, something which has unfortunately been left out of the medical model. It's only by viewing the body as a multi-dimensional energy system that we begin to approach how the soul manifests through molecular biology, if you will. At one point in the evolution of human beings, our meridians were once connected to what is called an axialtonal line and grid system. Which actually connects to higher dimensional energy matrices that extend beyond the etheric body and which may hold a perfect pattern of health and balance. This may be the area where Reconnective Healing may really work. In reconnecting our meridians to these axialtonal lines and grid network. John Day, MD, Board-certified General and Vascular Surgeon graduated from Tulan Medical School in 1977, completed his surgical residency in Baltimore at the University of Maryland. Joined surgical practise in Boulder Colorado where he spent the next 25 years. John Day decided to put down his scalpel and practice Reconnective Healing instead. Through his own career-long series of questions and discoveries, including an intense personal study of Eastern and other holistic healing systems with world-renowned authorities including the Dalai Lama's personal physician, Day decided the current mentality of Western medicine is not as conducive to healing as what he felt he could accomplish by other means. "I made this decision because I knew it would take me into higher levels of understanding. It would help me heal myself and others more completely," he says. Day says his peers' typical response to more holistic approaches to healing is, "Where are the studies?" "What is the proof?" "It threatens them," he says. "Their construct is too inflexible to let them even look at it. It's against all of their ego training - the things they invested their energy and money in - and they feel like they would invalidate themselves if they would do this, but it would only make them greater healers, in my opinion. Reconnective Healing will only enhance what they offer their patients, even if they choose to stay in more traditional medical practices." Mark O'Connell, MD, Internal Medicine Specialist & Senior Associate Dean for Medical Education at the University of Miami School of Medicine. "I am a very traditional doc," O'Connell says. "I teach internal medicine. I'm on the faculty of a medical school. I'm one of the Deans. I'm definitely not out there on the fringe. And this definitely rattled my construct of how the body works - how disease works." "What I personally witnessed with my own patients definitely got me wondering," he says. "Where does all this fit? There is definitely a mind-body connection - nobody can deny that, whether you are an integrative medicine person or a traditional western medicine practitioner. The mind and the body are one. And anybody who denies that is not paying attention." O'Connell recalls observing firsthand one of Eric Pearl's healing sessions with a patient who had serious chronic medical problems which were going to require surgery. O'Connell says that as he watched Pearl "waving his hands around over her," he witnessed a dramatic improvement in her condition. Intrigued, O'Connell says he then selected a few other chronically ill patients and asked them if they too, would like to try a session with Pearl. In exchange, he asked each of them if they would be willing to answer some questions after their session, and he asked them not to discuss with others what they experienced. O'Connell says they returned with surprisingly similar reports and dramatic improvements. One of his patients with great difficulty walking, walked around easily after a few sessions with Pearl. Still another, a child with cerebral palsy who couldn't walk into O'Connell's clinic without leg braces and help from his mom, was able to run out after Pearl's session, carrying his brace! "Many members of our faculty have seen Eric's work," O'Connell says. "And almost everybody is intrigued by what they've seen." Disclaimer: We make no claims, promises or guarantees and are neither diagnosing nor treating specific health challenges. You are solely responsible for seeing to and/or continuing with your own medical treatment and care.